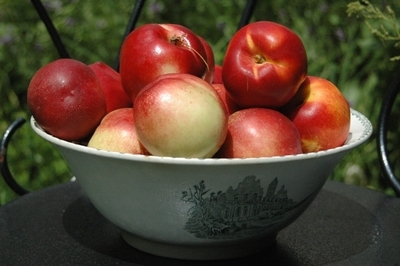 There is no greater satisfaction than coming home from the market with a basket packed full of seasonal delights….like peaches of all sorts and nectarines, all at their peak right now. I hardly get time to do something with them, they disappear fresh into a mouth as soon as they hit the fruit bowl on the dresser. Yesterday I kept four aside with the intention of making this light and fresh dessert. I ended up eating them fresh myself. But I managed to get hold of four ones. A recipe from Cape Town food by Phillippa Cheifitz which I adapted a bit. Bring the water, wine, sugar, vanilla pod and seeds and cinnamon stick to the boil in a large saucepan and simmer until the sugar has dissolved. Add the nectarines and immerse completely in the syrup, cut side down. Simmer gently for about 6 minutes, depending on the size of the nectarines. They should still have some firmness. Remove from the syrup. Reduce the wine syrup over high heat until slightly thickened. 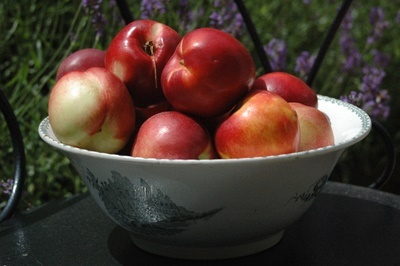 Pour over the nectarines and keep in cool place to infuse. If desired, it kan be refrigerated, until served. I prefer it room temperature. 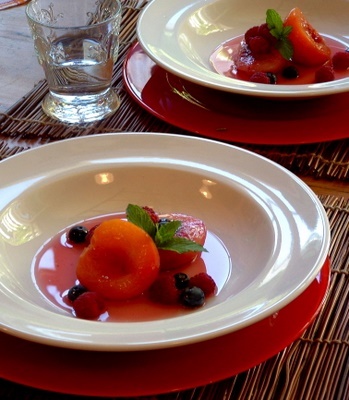 Serve 2 halves in a pretty bowl, drizzle some syrup over and decorate with some summerberries of your choice and a mint leaf. –>OH MY GRACIOUS!!!! I AM SALIVATING ON MY KEYBOARD!!! GLORIOUS! SIMPLY ELEGANT! –>Thanks Lin..oh dear, hope your keyboard’s OK, hie hie..
Jeanne, oh I will keep an eye out, it sounds great…glorious combination.